On the day that Chelsea Manning was to be awarded in absentia the Sam Adams Award for Integrity in Intelligence, supporters from Oxford and beyond gathered on Cornmarket for a couple of hours in the afternoon for a solidarity vigil. With banners “Free Private Manning” and “Free Assange, Free Manning, End the Wars”, Free Manning stickers and postcards for the Private Manning Family Fund, six of us engaged with the passing Oxford crowds. There was a fair amount of interest from locals, students and tourists and some interesting conversations about Manning, Snowden, Assange, privacy, surveillance and endless war. One man described how his best friend had spent 14 years in the military, including the SAS, and now struggles to live with the atrocities he committed under government orders. A student who’s researching privacy and the internet lamented the eagerness of people to give up their privacy (when offered a couple of pounds to do so in a research exercise). A dozen foreign students stopped by to ask what we were doing and all left wearing stickers, another passer-by put one on his bike and we were interviewed by the local Cherwell student newspaper. At 4pm, we headed to a local cafe to warm up, then three of us strolled over to the nearby Oxford Union for the award ceremony. The award ceremony was hosted by Ray McGovern, ex-CIA officer and Sam Adams Associate, who offered many thoughtful reflections during the evening. McGovern began by speaking about his late work colleague Sam Adams, an intelligence analyst who had discovered that the US government was deliberately and seriously underestimating the number of Vietnamese troops in an effort to obscure the truth that the Vietnam war wasn’t winnable. Adams at first spoke up only within the system but later regretted that he had not spoken out publicly sooner. McGovern went on to talk about Daniel Ellsberg’s regrets that by the time the Pentagon Papers came out in 1971, it was too late for Vietnam. Whistleblowers need to speak out and they need to speak out with documents to be effective and Manning did that very well. He was motivated by what he saw – war crimes. He saw young Iraqis his age being wrapped up and put in jail, just because they wrote a thesis. He went to his superiors and they just said ‘forget about it’ but he couldn’t, because he had a conscience. Manning had personal experience of human suffering that he witnessed in Baghdad as a foot soldier. Those gathered were shown an English language version of the German Panorama programme that deals with the Collateral Murder incident, footage of which was denied and withheld by the US government in spite of requests from Reuters whose journalists had been killed in the attack for this information, that was eventually released by Manning. Ray commented that no US TV programme wanted to talk about Collateral Murder. did what I didn’t have the guts to do in the Vietnam war. There is a misunderstanding that many whistleblowers are at fault for breaking an oath they have taken to keep things secret. McGovern made it clear that this isn’t the case – the oath is to uphold the Constitution, not to protect those guilty of corruption and cover up. Don’t call me a saint. Don’t dismiss me so readily. He is not only a patriot for his devotion to the Constitution; he is also a prophet. Prophets are people who stand on principle and warn the rest of us. At the age of 22, Manning had all this figured out and the guts to follow it through. Ray McGovern then introduced the next speaker, former British Ambassador to Uzbekistan and whistleblower on British complicity in torture, Craig Murray. Craig Murray referred to last year’s Sam Adams Award winner Tom Fingar, who worked within the system to insist that a real assessment of Iran’s nuclear capability rather than scaremongering should drive US policy in the region, thus forcing the government to pull back from war with Iran. Murray noted that Fingar is now the exception, managing to be effective from within – this is becoming harder and harder and consequently the award is more frequently being given to whistleblowers. Referring to his own whistleblowing experience and that of so many others, Craig Murray spoke about the smearing and character assassination whistleblowers suffer and the disinformation spread by the mainstream media. When Manning released Collateral Murder, the war logs and diplomatic cables, all of the mainstream media parroted the mantra that the revelations would inevitably lead to the deaths of innocent people. Not a single person, however, has been identified as having been physically harmed as a result of the leaks. under the absolutely pathetic bloody excuse that it was copyright of the US government. (WikiLeaks subsequently edited it back in). Murray spoke scathingly of how the Oxford Union has allowed itself to become subservient to a board of Trustees headed by Foreign Secretary William Hague. You should be ashamed of yourselves. Do something about it! The audience were urged to read Manning’s defence statement which she read out at a pretrial hearing in February 2013. Craig Murray then introduced Chelsea’s old school friend from Pembrokeshire, Aaron Kirkhouse, who she had asked to accept the Sam Adams Award on her behalf. After presenting the award, Murray handed over to Kirkhouse to read out Chelsea’s acceptance speech. the American government has been pursuing an unprecedented amount of secrecy and power consolidation in the Executive branch, under the President and the Cabinet. [D]id the American government, and particularly the same President and Department, have the power to unilaterally determine my guilt…? as well as the Freedom of Information case brought by the New York Times and the American Civil Liberties Union over the “targeted killing” of al-Aulaqi, an American citizen and others. The Judge in this case ruled for the government, not because she thought the people didn’t have a right to know, but because didn’t feel she had the authority to compel disclosure. Former MI5 intelligence officer Annie Machon, along with her former colleague and then partner David Shayler, blew the whistle on corruption including illegal phone taps, innnocent people left languishing in jail, IRA bombs that were known about in advance and could have been prevented and the botched MI6 illegal attempted assassination of Colonel Gaddafi (MI6 funded al Qaeda in Libya) that led to innocent people being killed. Machon believes that the risks taken by whistleblowers these days is far greater than those she and Shayler faced in the 1990s, but noted that there is no defence under UK law for breaking the 1989 Official Secrets Act. I salute what Chelsea has done. I salute initiatives of people like WikiLeaks, I salute Edward Snowden and share his fear that the revelations will not effect a change… We all share responsibility for the crimes of our governments and to effect change. To finish, Annie Machon spoke about how she and others are offering support and advocacy to whistleblowers everywhere through the Courage Foundation, and urged everyone to check out their work by visiting the website. one of the few defence attorneys for Guantanamo prisoners who actually got his man free. Pierce’s address echoed Manning’s concerns about the growing disregard for the American Constitution, with a bit of history to put current issues in context. The military rule that came into play during the American Civil War was largely brought to an end soon afterwards with the 1866 Supreme court case ex parte Milligan that ruled military commissions and military rule unconstitutional. However, cases decided during this period of martial law are now being used to try to suppress those critical of the US, proponents arguing that “US domestic common law law” can be used globally to bring people in front of military commissions and execute them. and warns that it is vital we realise that unless we fight back, things will only get worse. noting her many years in the military and then in the US state department where she was involved in both opening and closing embassies, her 2003 resignation from the government in protest at the Iraq War and her role as captain of one of the boats in the Gaza flotilla, with McGovern as one of the crew. McGovern spoke damningly of President Obama’s unwillingness to stand up to Israel’s Benjamin Netanyahu to insist that the flotilla should be given safe passage and noted how instead the US had exerted pressure on the Greeks to stop the boat reaching its destination. Snowden presented a specially prepared video address for the occasion, speaking about the vast over-classification of government documents, so many of which have no bearing whatsoever on national security. In 2012, some 95 million documents were withheld from the public, many of which are unambiguously necessary for the public to know about. For instance, how can we vote without evidence of the true cost of the wars we’re involved in and the war crimes that are being committed? These are all represented in Manning’s leaks. Snowden argued that the public in partnership with a free press can correct the errors of well-meaning but misguided officials. Ray McGovern drew together the threads from all the speakers before opening up to questions from the floor. Guantanamo expert Andy Worthington made a comment from the floor about the change from an analogue to a digital world. Previously, our data could only be stolen by physical violation of security – a break-in or leak of papers – whereas now all our information can be harvested remotely without our permission or knowledge. More people are becoming aware that what is being collected about us is beyond anything that is reasonable or necessary. We desperately need some political change. Ciaron O’Reilly spoke about the work that has been done in Wales, Ireland, Scotland and England over the past three years in solidarity with Manning and Assange and, more recently, the links that have been made with Chelsea Manning’s Welsh family. A couple of weeks ago, members of the family travelled for the fifth time to visit Manning in prison, the first occasion on which they hadn’t had to pay their own travel costs. The Private Manning Family Fund is continuing to raise money to fund future visits. Ray McGovern concluded the evening with an exhortation to everyone to do whatever we all can to keep Chelsea Manning in the public view. 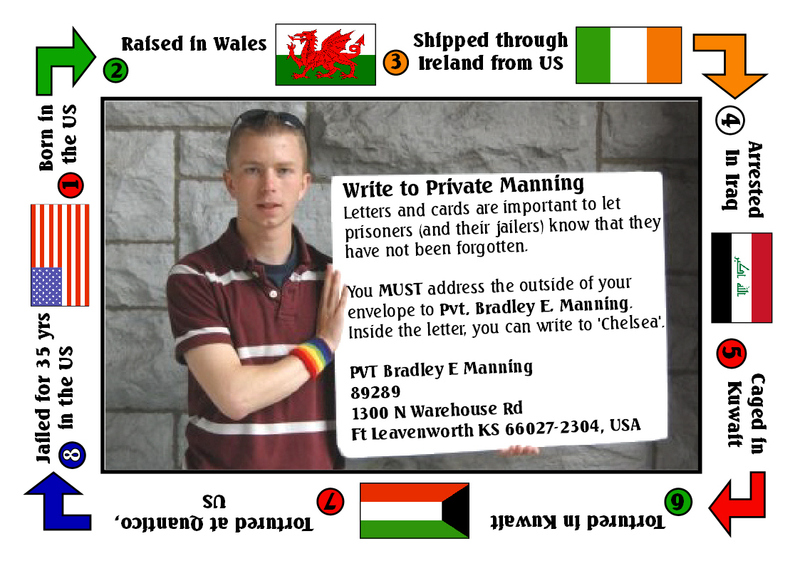 As people left, we handed out our Family Fund postcards that have information about writing to Manning on the reverse. See also this earlier post for more about the award ceremony and also this article by Silkie Carlo. Gallery | This entry was posted in Reports and tagged Aaron Kirkhouse, Ann Wright, Annie Machon, Bradley Manning, Chelsea Manning, Craig Murray, Oxford, Oxford Union, Ray McGovern, Sam Adams Award, solidarity, Todd Pierce. Bookmark the permalink.